Just came across this image in Google, and thought it was cool. It's from what was apparently the first ever Human vs. Computer Showdown in Toronto back in 2006. Former world Scrabble Champion David Boys, of Montreal, was defeated by computer super brain "Quackle". This reminds me of the first ever human vs. computer chess game, when MacReady got pissed and poured good ol' J&B into the computer. Nice. 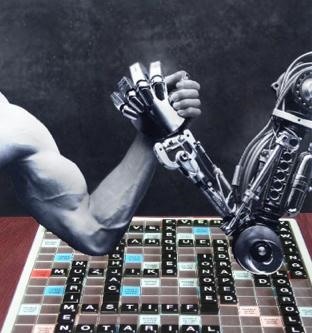 Apparently, they've been reusing this image for all of the Human vs. Computer Showdowns. It was used for the last one (last weekend).